One of the great things about being a teacher is the wonderful people you meet and get to know. 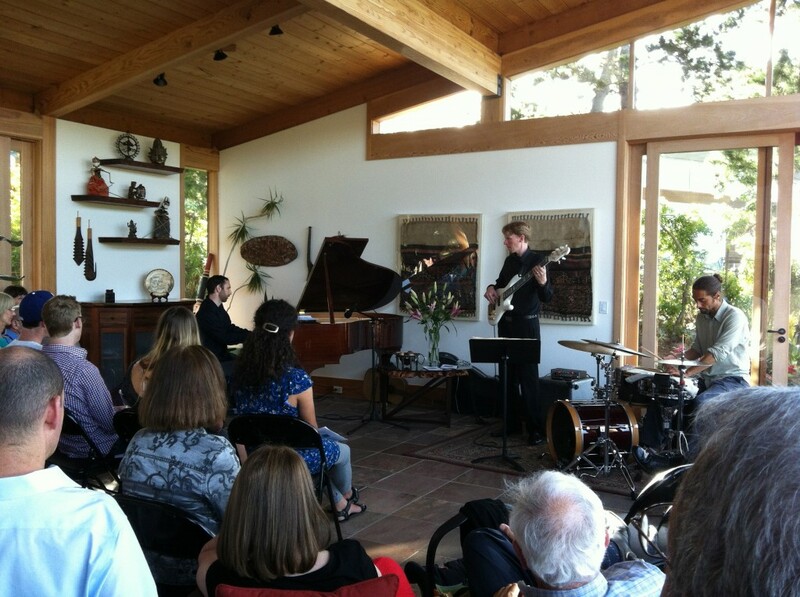 This past week, I had the pleasure of bringing my trio to the home of one of my students (Ginny) for a house concert/conversation about improvisation. This turned out to be such an enjoyable and fulfilling experience. The gathering began with some delicious hors d’oeuvres, wine and chatting. It was great meeting people before we performed and they were very eager to talk about jazz and improvisation. The actual program began with a short talk by another piano student of mine, Arnold Mandell, who is the founding chairman and distinguished professor of psychiatry at UCSD, and a MacArthur Prize Fellow in theoretical neuroscience. His talk was about brain states that facilitate innovation. It was very interesting to hear his remarks and this helped us focus our attention on thinking about the process of improvisation. Improvising is something I do on a daily basis, and while I put a lot of thought into how to get better at improvising, I don’t think too much about what is going on in my head as I am doing it. The attendees asked some great questions which led to Justin, Julien and me sharing some of the following ideas on the topic. On the surface, when we improvise, we are following some sort of guidelines for creating music in the moment. As a pianist, I work with the harmonic structure of a song, and use scales that are associated with each chord to create melodies. There are a lot of parameters that I can work with including varying rhythms, alterations of scales, enhancing scales with chromaticism, playing with intervals vs. linear lines, etc. We didn’t want to get too deep into the theories behind improvisation, but it was important to introduce the basic principles. On of the ideas we arrived at in our discussion is that improvising on an instrument is much like having a conversation. In speaking, we rely on our vocabulary and our knowledge of how words are placed together to form sentences. We don’t preplan everything we say, but somehow we form coherent sentences as our thoughts are occurring. Improvising on instruments is exactly the same. Our vocabulary is scales, chords and rhythm. The grammar is how we put those scales, chords and rhythms together in a way that is musical. So what about feelings? Do our emotions affect the way we improvise? Are we reacting to all five senses, or just a few of them? These were some of the more thought provoking questions. I think while it is possible to improvise without pouring any emotion into the music, it’s always much better to be approaching the music from a place of feeling. Sometimes, very challenging music gets in the way of musically channeling emotions, and we are more concerned with getting through the piece without “messing up.” That’s why we constantly have to practice – so that we can fully present in the music while we perform. Speaking about all this in between each of our songs had a great effect on how I performed. It constantly reminded me of what is most important in giving an emotionally compelling performance. Connecting with the audience through discussion and performance felt so good, and I hope to carry this on in future performances. 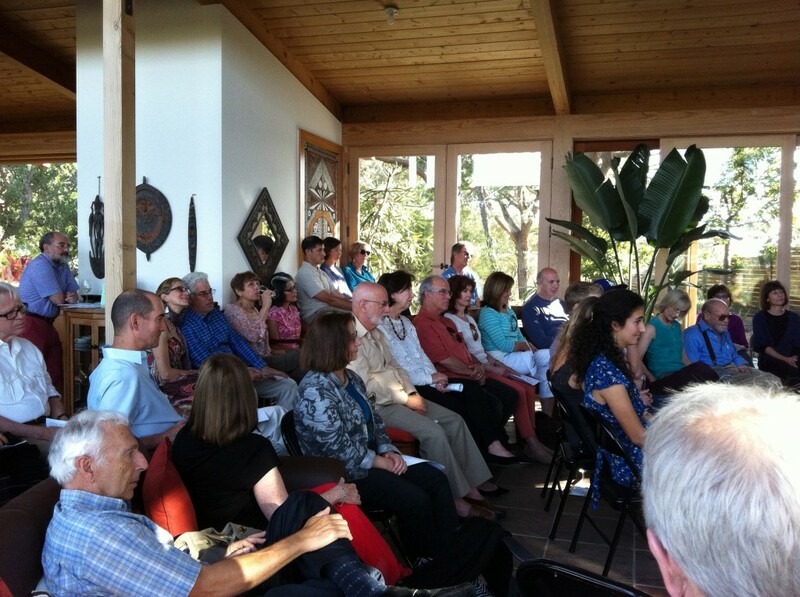 Thank you to all those who attended and shared this wonderful afternoon with us! And thanks to Ginny and Bob for hosting, and we’ll look forward to next time!